Over 2 million people have read the New York Times bestseller Wonder and have fallen in love with Auggie Pullman, an ordinary boy with an extraordinary face. Listeners have also been given a special look at another side of Auggie's story with The Julian Chapter and a peek at his life before Beecher Prep in Pluto . 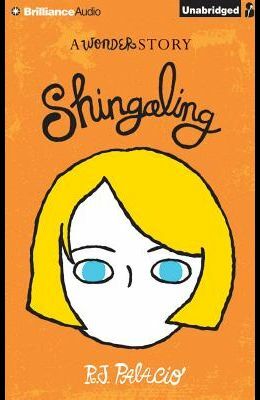 In Shingaling , the third Wonder Story, they'll listen about life as a fifth grader at Beecher Prep through the eyes of Charlotte, the girl who had been chosen to be Auggie's welcome buddy. Listeners will not only learn more about Charlotte and her budding friendship with fan-favorite, Summer (they solve a mystery together), but how the girls at Beecher Prep react to Auggie attending their school for the first time, and how Charlotte came to write the precept she used at the end of Wonder , It's not enough to be friendly. You have to be a friend.